Marco posted yet another A+ quality start on Sunday night, with six innings, 2 earnies, and a 2:7 control ratio. He did this, sadly, with his B- stuff. Dr. D was in a deep melancholy, watching him pitch without his curveball, honestly the very first game I remember all year in which he didn’t have it to work with. Despite this, he continued a 5-0, 1.58 tear in which opponents are batting .198 and he maintains a 31:5 control over 34 innings. Over the season, his 12-5, 3.37 tear has him #10 in ERA and #3 (!!) in games won. With 12 starts remaining he's got to win 8 of them to score 20, but more reasonably if he goes 5-2 or 5-3 then he finishes 17-7 or 17-8. Which would mirror his current career record, 17-8. There was a pitch in the 4th with which I was particularly taken. Marc-O had thrown a first pitch strike, of course, and then he set himself IN THE STRETCH as always, wound, and pulled the string on an 82 (!) changeup for a garbage swing. I was taken with the pitch not only because the changeup velo is dropping a bit here and there, but with the body language he used to throw the pitch. We are here to tell you that the usual cliche is here as good as gold; this guy pitches with the savvy of a Mark Beurhle. With the bases loaded and one out and the defense at fault, where does Marc-O's body language go? Straight to victory, mates. He used a deadfish 82 MPH change to strike out the next man, no runs scored at all; then the next pitch a curve ball was popped up to short center field. A 1-out Houdini. While we're raving, there is another thing I love about the pitcher: he does not strain to hit 89, 90 MPH. He can and does hit 93, 94 MPH when he wants to, but he doesn't want to. James pointed out years ago that soft-tossers tend to get injured more because they're always straining to get their fastball up to 90; Marc-O is an exception to this rule. So was Moyer; so is LeBlanc. These are graceful, balanced pitchers who hit their 90's and 89's and 87's with a buttery-smooth motion. That's important. Velocity is one of the factors that goes into durability, but so is strikeout:walk ratio. Billy Beane always has a stable full, which he rides hard and puts away wet. (We're confident that JeDi is working on this problemo as we speak). Back to the CTL ratio: Marco's is 111:25, which is #8 in the AL, just ahead of Gerrit Cole and Trevor Bauer. Take off your hat a moment. Reflect on the fact that a healthy Marc-O and a healthy Wade LeBlanc are the two things nobody saw coming, and the reasons we sit on top of the Wild Card. What a couple of finds by Jerry Dipoto, wouldn't you say? NICK VINCENT. Not sure what happened to this guy. One moment he had the number 2 swing and miss fastball in the American League; next moment he’s useless, looking for innings in a 6-run game, and botching that. Anybody know what happened? JUAN NICASIO. In theory, the ability to swap him in with Pazos as matchups dictate in the seventh inning, gives us a fairly exciting and should-be stable lead into our twin closers. In practice, he can into the game and went from 92 92 93 93 93-pop up. Your thoughts would be? Mine would be, I want to see 95 first pitch, end of story, or beginning of story, whichever is closest to $8M. :sigh: He got out of the inning at 93. CLOSER. Dispatched the first two rodents easily with that 91 mph dive ball. An amazing pitch. You try to compare; Felix' awesome 90 MPH "changeup" / dry spitter reminds, but this is even better. Got the last one on the pop up. Pitched like a closer, which is what we traded for. MEGACLOSER. We're 47/47 when he enters with the lead. I can remember a few Mariner teams that didn't. Are you taking a moment to savor the show? It ain't that often it comes around. MORE FREE SHTICK. At my 2nd site D-O-V there' the "extra" post you paid for. ;- ) If you enjoy the Think Tank and crave its sur-vival and thr-ival, you may wish to check out Dr. D’s fundraising shtick. Or if you know you’re ready to join the Ownership Committee, here’s a direct link to the sponsorship page. Thanks! I immediately went to 1997. I can only imagine what could have been. B-R makes it pretty clear that the Twins are willing to trade Lance Lynn, as they are going nowhere and he's a goner after the season. The price can't be too steep. You will remember that we really can't sit and evaluate one more Felix performance, as the deadline comes and goes. I will point out that anybody who is too optimistc about Felix's chance of "finding" his B- stuff is missing two seasons of the alternative argument. Since opening day of '17 he has thrown 199.2 innings and is giving up 9.2 H/9, 1.5 HR/9, 2.9 BB/9 and has a FIP just shy of 5. Basically the safe bet with Felix is that he gives you 5 innings with 3 ERs, which he did in the 3 consecutive stars prior to his last dismal outing. To tell you the truth, I really really want to say that I have no desire to see Felix again soon. In his first 4 starts this year, he had 3 productive ones (innings and ER's); 5.1/0, 5.2/3, 6.1/2 and one ugly one. He threw 21.1 innings with 13 ER's. His ERA was 5.4. In his next 4 starts he again had 3 decent ones (liberally described as 5+ innings, 3 ER's or less) and one ugly one. He threw 23 innings with 12 ER's. His ERA drops to 4.4. His NEXT 4 starts (#'s 9-12) saw him limp in with only one decent performance, 22 innings and 17 ER's. That's an ERA of just about 7! Yikes. Starts 13-16 saw some rejuvination with three starts of just one run allowed, 23 innings and 8 ER's. His last 5 starts have totalled 23.2 innings and 19 ER's. That's an ERA north of 7 again. Dividing his season into quintiles, you find 2 terrible ones (7+ ERA), one mostly terrible one (5.4), one "fair" one (4.4) and one of VG status (3.1). But in 7 of his last 9 starts, he's gone at least 5 innings and given up 1 ER three times and 3 ER's 4 times. I have no idea how. Lookee here: Other than his slider (and he's thrown just 123 of them all season) , he's given up LD% of between 24% and 38% on each of his offerings. The 38% is on his fastball. He has no fastball. His Fly Ball % on his "heater" is also 38% and 15% of THOSE leave the yard. Basically that means that on 44% of his fastballs put in play, opposing batters cream the snot out of them. But then again, he is aware of it. He has thrown only 208 FB's (Fangraphs) all season. His sinker-curve-changeup #s are 555, 492 and 484. Last season he threw the FB in equal amounts to the sinker and curve. This season he has abandoned it. He throws it at an 89.2 MPH average. Even last season it was 90.5. Hitters are pulling 51% of the balls they hit this year (a career high) and only going the other way 15% of the time. He's fooling nobody. Considering all that....he performance this season (in terms of games with 3 ER's or less allowed) is decently remarkable. He's living totally on his curveball (w6.0) and everthing else gets creamed. Even his change-up is a fraction (+0.7) of it's former self. Sigh. I think I will start cringing each time he takes the mound. I will admit, however, he's completely smoke and mirroring it. Somehow. Can he keep it up? Don't ask me if you want an affirmative answer. Which brings us to Lance Lynn. His FB hums up there at 94.1 MPH. His career best was as a rookie at 94.2. His arm is just fine. But despite that his FB is a - pitch (-10.3) for the first time in his career. As always, he throws the FB a ton, he's an un-Felix, but is giving up that - number AND he is BB'ing 5.4 guys per 9. His K's are up from last year (his 1st year back after arm surgery), his homers/9 are down...but his BB's are up. Fix the BB's...(he's allowed 5, 3, 5, 4 and 6 in his last 5 starts) and he's still pretty good. And there is this about Lynn, he was creamed in 4 of his first 5 starts this season (5 or 6 ER's four times), but since then he has givein up 3 or less ER's in 13 of 15 starts, and has had 5+ innings of 2 or less ER's in 7 of his last 12 starts (in 3 others he allowed 3 ER's). Lynn is struggling with command, but he's still been a reliable starter, excluding his first 5 outings of the season. He's run a 4.1 ERA in the 15 outings since,. If you discount a 1.2 inning, 7 ER debacle on July 1st, that ERA drops to 3.1. Despite the BB's. He can help us...and he won't cost too much. But times a wastin'...and has been for 3 weeks. 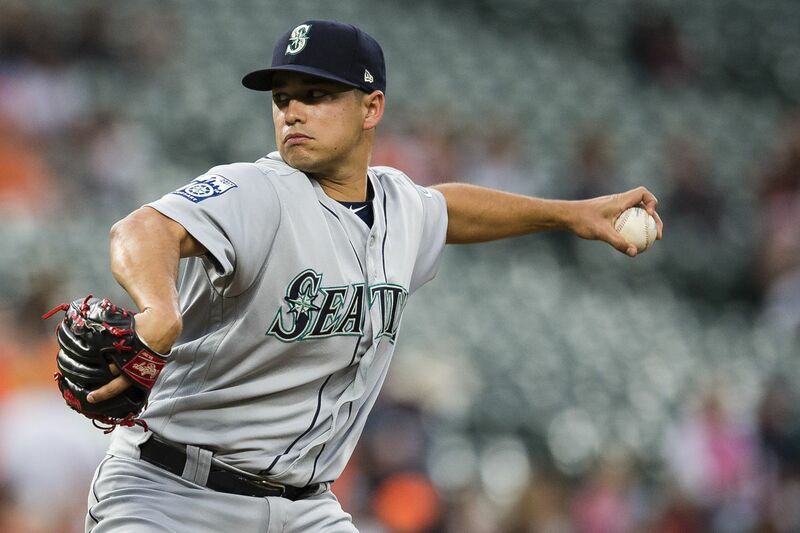 Seager gets traded, Dipoto says the M's will use Healy at 3B with Vogelbach at 1B (or Cano). With Healy's better offense, but obviously worse defense, how much of a tradeoff would there really be? Not much, imo. His value would be from offense instead of defense. :shrugs: FINE BY ME. Also in my opinion, there is not much of a difference between Healy/Vogelbach than Seager/Healy at this point all things considered (including upside). Also also in my opinion, we could we do better with the money we would save by trading Seager and spending it on a competent LF or SP. Becomes a real reality budget-wise when you shrug off Zipchin, Nicasio, Felix (after next year), Cruz and Seager. If Dipoto stops spreading his $'s on several scrubs, he could afford another star. Haniger/Gordon/Harper sounds real nice next year. As much as I dislike Bryce Harper he is exactly what we've been missing in our outfield, at the right age. It's all about those dolla dolla bills. Not a great trade though. You won't be able to extend him, so the talent you pay (significant) goes out the window. If he's the 'right guy' you figure JeDi will go after him in the offseason, and I'm game. But it's hard to see the M's extending to get him at this particular juncture... much as I'd love to see the difference his addition would make. His BA, BB rate and Slg % are at career low. Well, actually he slugged a bit worse as a rookie. The question about him is if the shift has bamboozled his bat so much that he’s worth nowhere near $19M per. He hit between .258-.278 for six straight years then fell to .249last season. It sits at .228 for ‘18. He has sort of fallen apart. Well...Lance Lynn goes to the Yankees. But the Mariners did trade with the Twins, picking up Zach Duke (for De Jong and and MiLB 1B/3B Ryan Costillo, a guy who has raked in his first two pro seasons: .331-.430-.634 in Rookie Ball last season, .266-.3560-.486 in A Ball this season)..
Duke is having a weird year. He gives up 10.6 H/9, 3.6 BB/9 and K's 9.4. But he hasn't given up a HR all season. I'm not excited about giving up Costillo for him, but Dipoto is in the mood to acquire all the relievers in the world. I don't think Duke brings anything an Elias might not. We might get 20 innings out of him from here on out. But there is indeed that jones that Dipot has for RP's. Which explains the fact that we also picked up Adam Warren from the Yankees. Cost is some international cash and players yet to be announced, it seems. Warren has been a fine RP over the past two seasons, running a combined WHIP just a hair over 1.0. He K'ed 8.5 guys lasts season and is over 11 this year. We might get 25 innings from him. When in doubt, trade for relievers = the Dipoto Theorem. We picked up one from each side today. Both guys walk after this season, btw. A promising MiLB bat for 20 innings and a bye bye from Zach Duke seems as bit expensive. But moves are moves and we have some other 1B farm guys who look good. Seager gets the night off tonight...weird becuase a RHP is up. But then Seager is .205-.253-.288 over his last 20 games. Ugh! But...instead of moving Healy to 3B (he can "play" the position, after all) and giving Vogs the 1B start, Servais has decided to go with Andrew Romine at 3B. Romine is hitting .192-.263-.212 vR this season. But he does have on vR double. So he has that going for him. I'm betting he doesn't add much offense tonight. Servais hates Vogelbach, I am convinced of it. Edit: My bad, Seager to Paternity List. Vogs actually back down to Tacoma, Vincej up. stand by the Servais hates Vogs thing, although it may not apply here.